I'm a social scientist that is surrounded by medical doctors. As such, I often have to struggle for some professional respectability at work. Unless, of course, they have a noncompliant patient, and then it's all, "Could you please talk to this guy and find out what his problem is?" Oh, and then there's the periodic, "Could you read this paper and edit it for me? The submission deadline is 20 minutes away, and I don't have basic grammatical skills." Anyway, the point of my rambling is that I've had my fingers in several papers and posters that have been published and/or displayed. Yet, if you look at my CV, you'll notice a complete dearth of publications. The reason behind this is that when you have eight to 12 authors on a paper, the non-MD/PhD gets the shaft. That's me. Regardless of how much data I collected or if I almost completely rewrote the paper because it read like the product of a drunken colobus monkey with a medical dictionary, my efforts go unrecognized. So, I've grown weary of waiting for someone to be gracious enough to allow my name to grace an article. I've decided to take matters into my own hands. 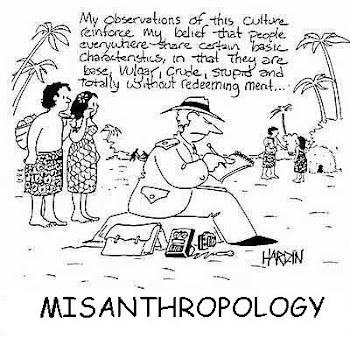 I realized that it wouldn't be very difficult for me to write an article discussing the influence of anthropology on an author's work since I've read just about everything this person has published. Once the article is written, I'll try to get it published in a literary journal at the very least. It's not a scientific article, but, hey, any publication is better than no publication. Unless you're publishing in The Watchtower. When I was outlining the article in my head, I foolishly thought that I'd be able to knock it out over a weekend. Maybe a full week with edits. That was two weeks ago and I'm not even halfway to my desired work count. The problem is not that I don't know the material. The problem is that I have to find the perfect citation with which to back up my argument. And when your source material is the work of an extremely prolific author, slogging through the texts can be a bit time-consuming. Not to mention nerve-wracking. What started out as a shameless effort to pad my own CV had morphed into a labor of love. However, the honeymoon is over and I'm now dealing with the harsh realities of completing a paper that even I have lost interest in. The only thing sustaining my efforts at this point is the thought of sweet, sweet vindication when I (hopefully) see my name on an article and the letters "MD" are nowhere to be found.